On Saturday, 28 July, Wael El-Fashny performed live at El Sawy Cultrewheel in Zamalek, as part of the activities of the summer programme at the popular cultural centre. El-Fashny presented 16 songs with his band, presented new singers, and got the crowd engaged and entertained. Not all El-Fashny’s songs are popular enough for the audience to remember the lyrics and sing along with the band - they require attentive listening to grasp the meaning. Yet the joy was obvious with the beautiful music and touching lyrics. When El-Fashny returned to his old repertoire, with Hawa Ya Hawa of Afaf Radi, and Betnadini Tany Leih of Dina Masood, the engagement was amazing. 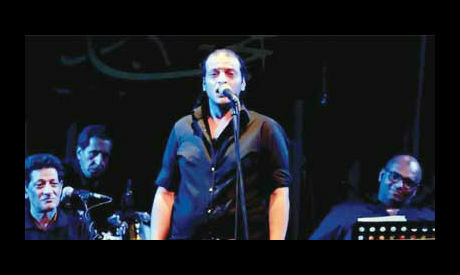 El-Fashny sang the classic Aho Da Elli Sar of Sayed Darwish with the audience without music. El-Fashny and the band played his most popular songs: the prelude song of the soap Wahet El-Ghoroub; Safer Habibi, sung in an Upper Egypt dialect and inspired by Egypt's southern heritage. Then El-Horoub, composed by Moodi El-Emam, the introduction song of the soap carrying the same name. And finally Kont Fein ya Waad, featured in the soap Tayee last Ramadan. El-Fashny's style, music and his famous songs require a special kind of audience: attentive listeners, not dancers. The lyrics, the music and his voice invite calm to the soul. Describing his voice is no easy task. He enters the soul with a soft and yet firm presence. His expression would not match Afaf Radi in Hawa ya Hawa, so he intelligently did not attempt to imitate her. But for the other older songs he was matching the original singers. His different lyrics, using the fusha (classical Arabic) in his songs, brings a kind of education and knowledge, and refined taste, also inviting the listener to think about the words and how it reflects on their lives and emotions. The best description heard by one of the concert attendants was that El-Fashny "was not polluted by the market." The audience does not always want someone who makes them dance. Sometimes a meaningful and deep song brings the joy of music to their hearts. This is exactly what El-Fashny and his band are capable of achieving. During the concert, El-Fashny presented three new voices by their first names: Amr, Badr and Mohamed. They sang with him a couple of songs and they gained the audience's approval. El-Fashny was paying tribute to the famous singer Aly El-Haggar, who introduced him in his concerts in earlier stages of his career. El-Haggar loved El-Fashny's young voice and encouraged his talent. It is known that El-Fashny considers El-Haggar as his mentor who taught him how to behave as a singer and deal with the audience and the media. He believes that artists should help each other, especially in their beginnings. The name Fashny brings to mind directly the famous religious vocalist Taha El-Fashny. Rumour says that Wael El-Fashny is his grandson, but the truth is that he is not a close descendant of the famous vocalist but a distant relative and also a big fan. El-Fashny was raised on Taha's songs and enjoyed his style in singing; his love for Tawashih is obvious, and the influence of Taha El-Fashny’s on him is clear specially in Khosaret El-Hor, a song on the theme of how the honourable must deal with the less honourable amid life's twists and turns in fortune. The moral is to hold one's head high while asking only for God’s help and never kneeling to the unworthy. The music, that was very near recitation of the Quran in style, brought the audience into a state of peaceful enjoyment. Wael El-Fashny started singing 20 years ago. His main teacher is the famous musician Fathy Salama who currently works with him as a flautist in the band. He later worked with composer Tamer Karawan, cooperating with the Karawan in many of his famous songs. El-Fashny described Karawan as an artist who works only with singers with which he reaches a certain understanding with on a personal level. Then creativity begins. The duo were capable of producing many successful pieces together. In the concert, and away from his famous songs, El-Fashny presented in an innovative way in southern heritage in mawawil and poetry, specially that of Minya, his home governorate. They have a special way of reciting music that he adopted, because he likes it and understands it, and to document it as well. Eventually he renovated and developed it. This is clear in the prelude of Wahet El-Ghroub. Attending El-Fashny concert was a pleasant experience. The concert hall was full and fans certainly got what they were hoping for.